Yesterway: The Collection Gap - Filled! 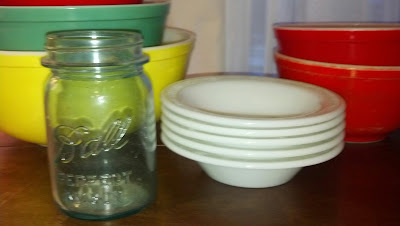 I'm certain by this post you have already gathered that I have a large amount of Pyrex and that I collect it with great enthusiasm. 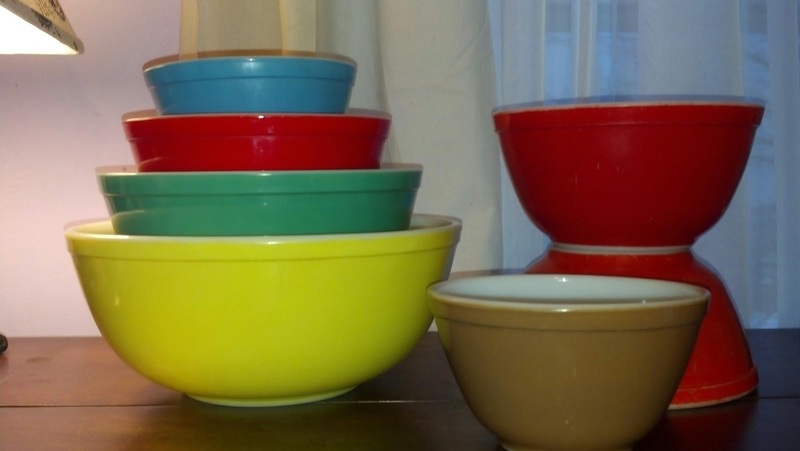 It may be a bit of a surprise to you that - until today - I did not have a set of primary mixing bowls. I know, I know...that's almost a crime. 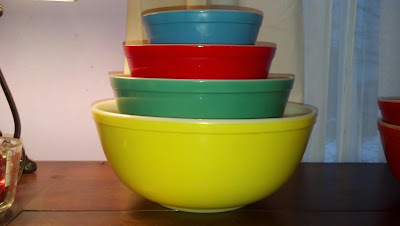 If someone mentions Pyrex, this is the mixing bowl set that comes to mind for most. Yet it was not represented in my collection? Even though I have three of the primary refrigerator sets? Something isn't right. I've got to explain how this happened. First of all I'm a naturally frugal person and could never bring myself to pay the sticker price on complete sets. Second, have you tried to find a red primary in the thrifts not completely trashed by the dishwasher? The most surprising reason though is that originally I didn't plan on even attempting to complete a primary set. I had much more interest in the turquoise patterns. 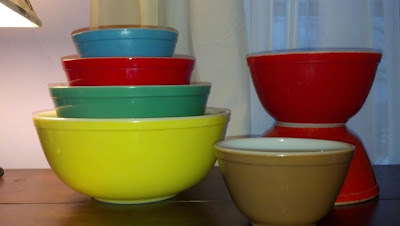 Well now that I've expanded far beyond turquoise...I felt the need to add some primary mixing bowl love to my collection. Just look at that red shine. He also picked up the small brown bowl. Now I have to spare red bowls...one being in "good" condition and the other (a 1940's un-numbered) in "fair". At Goodwill he also found a blue mason jar and five Pyrex dinner ware cereal bowls for about $2.50 for all. Go Dad! And this doesn't even include the gem he found a few nights ago...hmmm...that shall wait till next blog post. If I keep sending him out on my behalf, I will be broke shortly. Looks like dad has been doing a great job! I'm so happy for you that you now have the set. 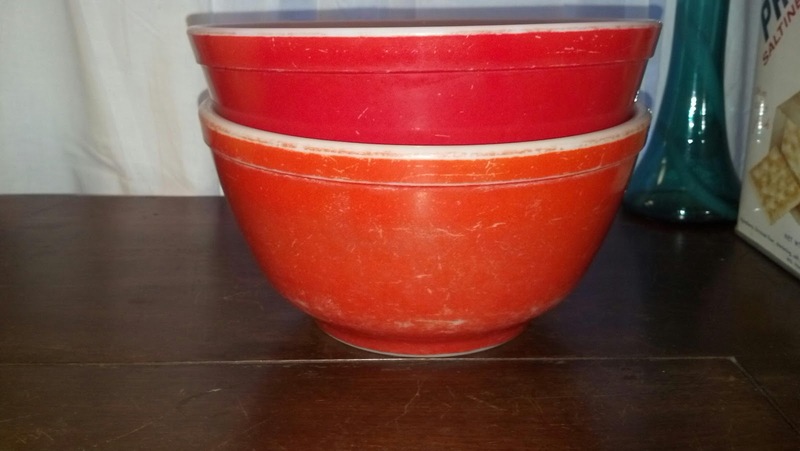 I have a complete set, and an additional mint red bowl that I found at an estate sale last summer. It was $5 so I couldn't just leave it there! The original set really is a timeless classic! Nice! Your dad is a good Pyrex hunter! I'm still working on my primary set too. Very happy for you! Don't you love sending out your family to thrift? Like a little thrifting army! Good for you for completing your set! I wanted a primary set so badly, and I felt like it was something I would never find in the wild. I broke down and got it from ebay-it was more than I would usually pay, but looking at other prices-fairly reasonable. I'm so glad you were able to get a complete set-it looks beautiful!